That night, Moon was the guardian. After a quarter of an hour, I dropped by to see how he was doing. I found him and Fael working busily. He would later sent me his chat log and comments. The title is his as well. This morning fael just arrived right after me. Moon Fargis: so this is the one to be rebuild? The teapot over the fireplace had to be rebuilded becasue the actual one was Not modifyable and turned to fast. Fael Illyar: Oh, by the way, I’ve been wondeirng, when you talk in English, do you first think in German and the translate or do you just directly write in English? Fael Illyar: I rarely use this outfit because I lack an AO that fits. Fael changed into a ice red ancient japanese style outfit. Second Life: Your object ‘Object’ has been returned to your inventory lost and found folder by Zen Retreat from parcel ‘Zen Retreat’ at Rieul 236.55, 211.946 due to parcel auto return. This happens when you wear the wrong tag on a land you want to build. Pema Pera: Hi there, Moon and Fael! Pema Pera: Glad to see you keeping the continued presence here!! an that happens when a new script is created inside of an object. Pema Pera: one that turns left and right? Pema Pera: wonderful outfit, Fael! Pema Pera: is there a theme associated with the dress? Pema Pera: by the way, Fael, exactly two days ago, I left early to have dinner with a colleague, after you had taken over and Hotaru had also briefly appeared. I presume that nobody else came after I left, is that correct? Fael Illyar: oh, right, I didn’t remember to send that log. Pema Pera: did no one else come? Fael Illyar: Yes, someone did come. moment, I’ll locate the log. 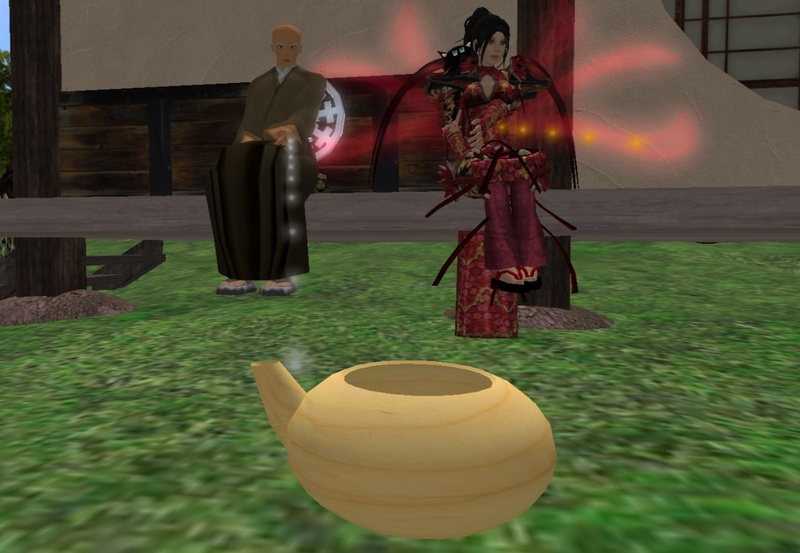 Pema Pera: Meanwhile, I’ll leave the two of you at work here — wouldn’t want to disturb the major improvement in tea pot dynamics :-). Pema Pera: See you soon again, and thanks for the log, Fael! Moon Fargis: what do you think of the logo nr 3? Moon Fargis: the one with the rays? Pema Pera: In fact, I like both! Pema Pera: But they are so different . . . .
Pema Pera: I could go with either one, or a combination — though that me be hard . . . .
Pema Pera: but thank you again for a great initiative!!! Pema Pera: See you, and say hi from me to Fael, when she comes back!